This print was commissioned by Classic Team Lotus and the set of images were computer generated ray tracings based on actual 3D helmet models. 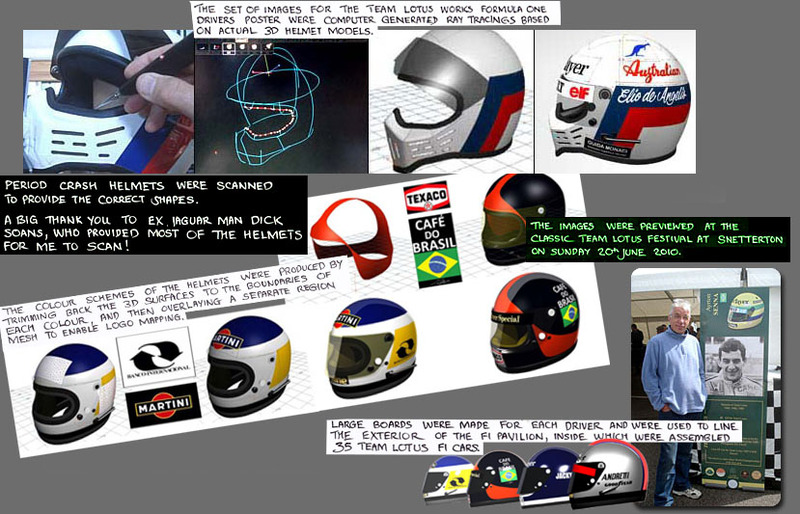 The set of images for the Team Lotus Works Formula One Drivers poster were computer generated ray tracings based on actual 3D helmet models. The colour schemes of the helmets were produced by trimming back the surfaces to the boundaries of each colour, and then a separate 3D region mesh was laid over the surfaces to enable logo mapping. The images for the poster were previewed at the Classic Team Lotus Festival at Snetterton on Sunday 20th June 2010 where large boards were made for each of the 34 drivers represented. These were used to line the exterior of the F1 Pavilion, inside which were assembled 35 Team Lotus F1 cars.